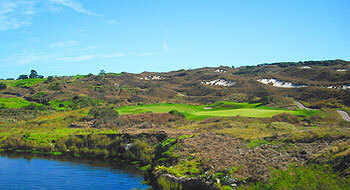 The Links course at Fancourt opened for play in November 2000 and it represents a unique and very tough South African golfing experience. The course was designed by Gary Player but only after the Black Knight’s team had studied in great detail the characteristics of classic Scottish links courses. The Links at Fancourt does indeed resemble a traditional seaside links course but so far they have failed to recreate the changeable British weather. It’s hard to believe that the host venue for the 2003 Presidents Cup, which resulted in an historic tie between Tiger Woods and Ernie Els, was once an airfield. The earth certainly moved at Fancourt and the result is a jaunty ramble through gigantic dunes with the majestic Outeniqua Mountains providing a stunning backdrop. Surely this is South Africa’s most unusual and remarkable golf course? The Links at Fancourt is a private club but a few tee times are available to guests staying at the Fancourt Hotel. So if you can’t befriend a member but fancy a real treat we recommend an overnight stay. I played The Links at Fancourt over the New Year period which is SA summer time. I was very fortunate as the night before i played there had been a torrential down pour of rain which meant the course had slowed up so both the fairway run offs and the greens weren't as severe as they could be. I was lucky as it made the course playable on the day i was there and it was a hugely fun experience. When the course is baked and the greens at full pace you could see there were plenty of holes which could really damage your scorecard. The course itself is fantastic and the place has an incredibly unique feel to it. Unlike anything i have played before or since. If i had to compare it to a British course its possibly most similar to Lytham St Anne's in so far as its not about beautiful landscapes but just a fascinating test of your strategic golf. Lytham is closer to a true links course however but there are a lot of great links features to this course and for me the crazy nature of it all seems to somehow work. There's also been a real effort in the design to work with indigenous plants to encourage wildlife and support the local ecology, something i think more golf courses should try to do personally and the signs all around saying watch out for the animals is a nice touch. The whole experience at Fancourt is 5* but the links they've taken to another level and provided a truly memorable experience. Your unlikely to be battling the wind like at most traditional links courses but that is something you should be thankful for, I can only imagine how difficult this place would be if the wind was blowing on a hot day. Like other reviewers here, Fancourt Links had been on my list for a while. Yes the course is exclusive in that you need to be invited by a member or be a guest at the hotel to play, and sure when you take into account the green fee and the requirement for a caddy it's not cheap by SA standards.....but the whole experience makes it worthwhile imho. Everything at The Links is done to the highest standards. The clubhouse is special, the practice facilities excellent, and 18 spectacular holes that just make you smile.....irrespective of where the ball goes! However, it would be remiss of me not to mention the Fancourt team. From check in staff to restaurant people to golf operations folk on all three courses.....they couldn't have been more helpful. I personally have to thank Lloyd Martindale, Fancourt's Director of Golf, as Lloyd very kindly helped arrange my visit and let Michael Fuzani (one of the pro's looking after The Links) accompany me on my 18 holes. So not only did I have the combined knowledge of Michael and my Caddy to call on, but I got to watch Michael play an excellent round of golf! Thanks to Lloyd and Michael. Like others on this site, Fancourt Links is now right up there with the very best courses I have played around the world, and I would encourage any golfer visiting the Garden Route to make sure you play this course before you leave. The sheer scale and size of the Links course is a sight to behold by itself. It’s an immensely enjoyable and impressive course to play. Without debate, it’s Gary’s best design in his global portfolio. Don’t be fooled by the name, this is not a Links golf course by definition, however the inherent pot-bunkers, blind drives and swashbuckling fairways immediately give the sense that you are beside the seashore. You’ll say “Wow” many times walking this course, and it’s clearly the best course built in South Africa over the past 50 years. The downhill par 3 2nd hole oozes quality and gives you the first glimpse of a feature which you’ll face many times at Fancourt – namely, forced carries! This course is a championship layout which players for the first time out will struggle to even come close to their handicap range. You’ll see pin-point landing areas, demanding dog-legs, wonderful changes in elevation and green complexes which will challenge the best players in the world. The land is so vast and rolling that there feels like a change in elevation on every hole, it’s truly an incredible piece of land. Architecturally, this course gets very high marks – especially the layered sod in the excellently placed pot-bunkers. These stairways to hell are iconic features on any “true links” course. Mr. Player routed the course in many different directions, but really took advantage of the natural landscape without creating the feeling that dozens of bull-dozers dominated the skyline when the course was being constructed. I especially love the fact that every hole at Fancourt (Links) has a name, which only adds to the unique personality that each hole brings to the course. A heightened sense of interest comes upon the golfers as we discussed the names of the holes and appreciated the character that each hole brings as you aggregate them all together. It’s easy to remember every hole on this course, which is a true testament to its merits. This premier course needs to be on every South African golf itinerary. The first thing to mention is that of the 100’s of courses that I have played around the world, The Links is an instant favourite and straight into a personal Top 5. Manufactured links course normally at best can be called ‘links like’ – the Links at Fancourt breaks the mould and is good as many of the world greats in GB&I that set the standard – if you think Royal County Down, Royal St. George's, Ballybunion etc. (all world ranked) then you are on the right lines. The dunes, the rough, the turf and the greens are perfect….. My recent round (walking and with caddies) was a delight from start to finish and I could write a book about all of the holes – but I’ll save that for another day and just pick my personal choices. The par-3 2nd ; around 200 yards downhill with six bunkers protecting is a great hole and picture perfect. The 9th is a strong par-5, it can play around 600 yards from the back tee and for most is a 3-shot hole with the approach being most key; a small ditch to be negotiated plus some severe run-offs. Nice touch at the halfway house, the food ordered on the first tee is ready and waiting ahead of starting the back nine… Special mention to the last four holes, all very good indeed. The 15th is called ‘Roon The Bend’ – a mid-length par-4 turning left with plenty of water left and behind the green – The 16th is another strong par-5, this hole is called ‘Westward Ho’ with obvious references to the Royal North Devon Club, England. The penultimate hole is a par-3 called, ‘Prayer’ and is arguably one of the toughest short holes I have ever played as there is very little room for error. The stone-walled burn that runs short and left of the green will collect anything slightly pulled, while playing safe to the right may result in a very tough chip shot – brilliant design. The par-5 18th is a joy to play; the tee is way lower than the fairway which gives an intimidating feel but there is a wide fairway waiting – a raised and undulating green ends the round – one of the most enjoyable ever. The Links is very private but there are times available as a Fancourt hotel guest; everything here oozes quality and the Links is the jewel. Must play, must stay. Well, this is a moment I was waiting for! Writing a review on a place I think and believe is at the top of the list on any ranking: golf courses, resort, maintenance, attention to detail, staff, scenary, everything is extraordinary. I wish many people were able to go to Fancourt and experience all their 3 courses at least once, and if possible replay The Links, a golf venue which hosted 2003 Presidents Cup and believe me has the highest standards in course design, maintenance, atention to detail and challenge. I was there on a Fam Trip invited by fellow Operator Scott Edkins from Ascott Tours and we played all over the place, but this course and Pinnacle Point were the highest points on the scorecard, really something every devoted golfer needs to experience by himself. We stayed there for 3 nights (the Resort Rooms are inmense, very comfortable and of very high quality) and on the first day we were made to play The Links. The course is something like 2500m from the Lobby, so you are driven in a very comfortable shuttle. Once there the Starter receives you and with the mandatory caddies asigned, some putting practice and you are ready to go. First high point is that on 1st tee you have to order your half way menu, which will be waiting for you when you arrive. Then caddies: they look like non golfers but they are very good, they know the course and can give you very valuable advice, go ahead and trust them!! And then the course ...WOW!!! All you can expect of a Top World venue together: design and challenge, greens speed like 12 feet, walking and feeling every step, playability, fast pace of play, can you ask for more? Just a note that more than 500.000 m3 of sand were moved to produce the course. About the holes: no bad ones and many memorable, like 2-3-4-8-9-10-12-15-16-17 and they tee shot from the back tee (mandatory carry of 250yds) of 18th give you the Full Monty. Is it tough? Yes, but fair and if you are in a good day, you can score. I scored 44 (+9) and 37 (even) with 4 birdies 12-13-15-16, a shame my first 10 holes were very bad but all the same I had a fantastic experience and I say is go and play it, you will want to play it again!!! And at night a wonderful barbecue at the Club House made the entire day a jewel. If you consider a new destination, South Africa will give you a lot more than expected. Very exclusive - The best course I have played in SA and probably ever - this bearing in mind I play 70 courses a year. This is without doubt the most expensive round of golf I have ever played which totalled in cost around £400 - the green fee is £160 and you have to be a Fancourt resident to play £200 per person plus compulsory caddies. That said it was an excellent day - the staff take you clubs and look after you all day. The caddies were all very helpful considering we had 2 higher handicap golfer (ladies over 30 handicap). The course condition was excellent and the layout and views fantastic. Considering the course is inland by 10 miles it plays and feels like a true Scottish Links course - but warmer. Without a doubt one of the best courses in South Africa, and maybe the best of them all. It is unfortunately one of only a handful of courses in SA that are not easily accessible (you have to be a guest of a member or stay in the hotel to be allowed to play there). 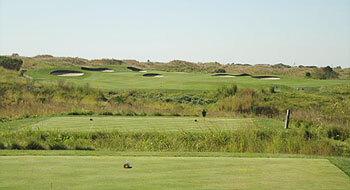 The green fee is also quite high by South African standards. That being said, the course and facilities are world class. Gary Player rates it as one of his favourite three golf courses in the world, and he has really created something special. He basically fashioned a man-made links out of an old airstrip, and even though it is a few miles from the coast, it looks and plays like some of the top UK links courses, and the dunes seem completely natural. A slight negative is the difficulty. In any kind of wind it is easily as difficult as Carnoustie (which I have played) or even more so. I played the course on a reasonably calm day, and still managed to lose a few balls. But the experience is fantastic, regardless of your score. The 2nd hole ("Long drop") and 15th ("Roon the Bend") were my favourite holes, but there is not really a weak hole on the course. Great layout, good caddies and a real challange!Go there!